Layering Alphabet Edgelits Dies by Stampin' Up! Create layered words or letters for tabs and other fun projects. 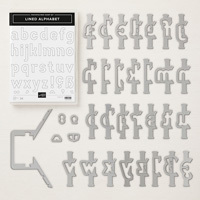 These dies are designed to interlock with included Edgelit piece to create cascading word projects. International characters are also included.